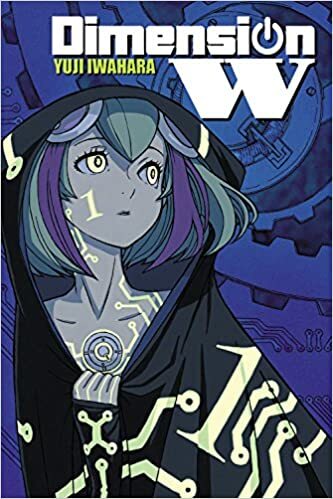 As I was checking out some manga deals on Amazon the other day, I made the fantastic discovery of Dimension W, the manga. If you guys have checked out what anime I’m watching this winter, you’ll know that Dimension W is one of two favorites that I’m following pretty faithfully. Slightly scared but also very curious, I decided to place the book in my cart and it now has a place in my home. In the future, a fourth plane with an endless supply of energy has been discovered and named Dimension W. Taking advantage of this resource, we created coils, which pull energy from this new dimension for everyday use. Few cars still run on gas, making gas prices skyrocket, and even robots have been added to the population. And like all things, there will also be the illegal use of coils, which is where Kyoma Mabuchi comes into the picture. Kyoma is a coil bounty hunter, and on his latest assignment he bumps heads with a robot girl who claims that her ‘Father’ needs the illegal coils Kyoma is supposed to bring in. Hating coils and anything related to them, Kyoma doesn’t believe the girl (who we later learn is named Mira) and tries to stop her escape only to later end up stuck with her. As the story begins the reader is thrown into three different scenarios. The first has Kyoma on the job as he’s found his target and explains he’s a Collector. The second scene spans a few pages and explains how the world is currently working, what coils are, and some important people in our history. And lastly, we’re thrown into the present where we meet Kyoma properly as he’s working in his garage. Getting a phone call from Mary, he’s scheduled to meet with her for his next job. When he’s briefed, the next job appears to be easy – find some thugs and confiscate the illegal coils they’ve acquired. Of course, when he actually arrives at the location he realizes things aren’t as easy as he supposed when a girl is brought into the room by one of his targets. Making his presence known, he emphasizes that he’s not there to save the girl and later also mentions that he could care less what happens to her. 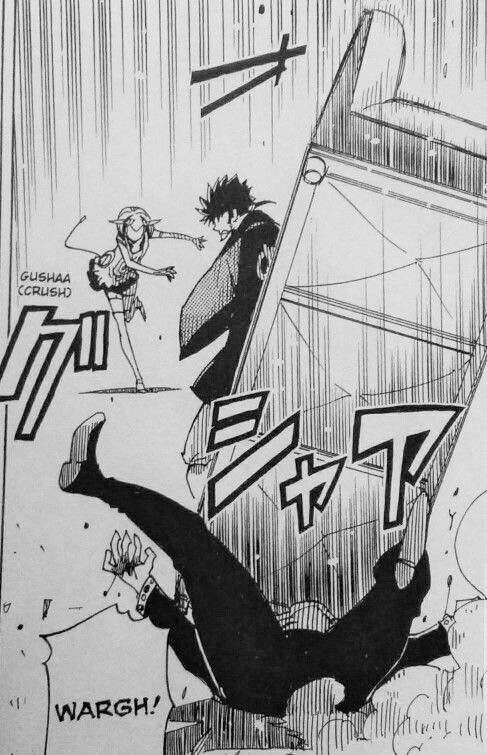 Angered by such a disrespectful and uncaring attitude, the girl reveals that she’s not exactly human as she throws a couch and thug across the room, then slaps Kyoma, rendering him unconscious. In the manga there’s a shadow of another woman in his memory as he remembers Mira crying. Also, instead of Mary saying “Why are you asking that out of the blue?” we get something else. Kyoma stays quiet and Mary says, “Old flame on your mind, Kyouma?” which then leads to a talk of cybernetics. I feel like if this had been added to the anime the reason for Kyoma’s hatred of coils would have been more connected to the story. I don’t know about you guys but when that episode of Kyoma’s past came out I was slightly confused. It just felt like the show had been put on pause as we were given the whole explanation. In the manga it’s different. 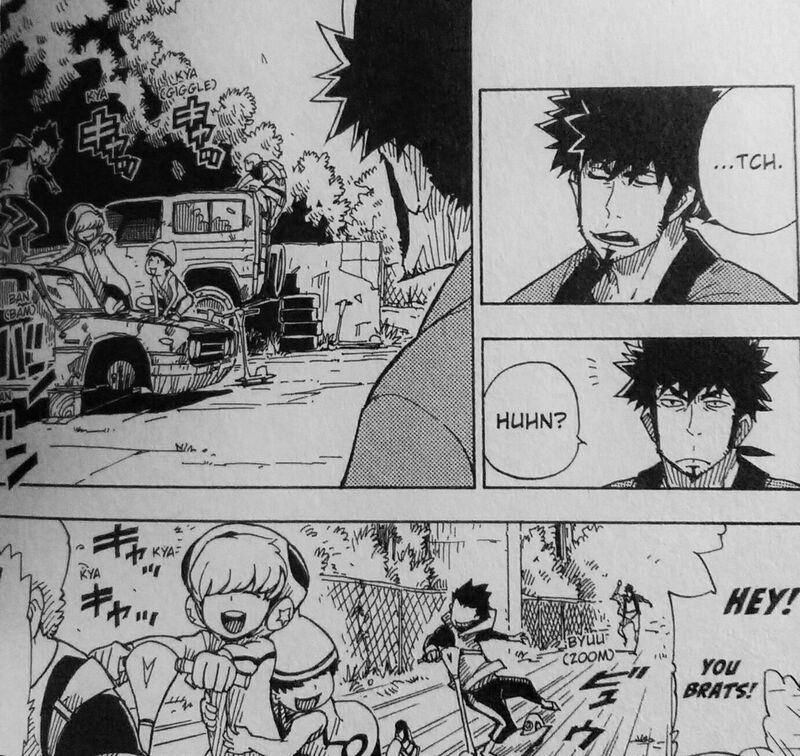 We actually have Kyoma yelling at the kids and saying, “And don’t come back!” It may seem like something small but it really changes the mood and the character. It gives Kyoma more presence and sass, compared to the anime where he’s kind of just there. Other scenes that show this difference in attitude are when he talks with Mary (“Stick to being just big-bodied not big-voiced too…”) and banters with Mira (“‘cos robots faking sighs don’t sit well with me”). Overall, I’m really excited to read more of this, however, the second volume doesn’t come out until May and the third volume until August. While the anime by itself already impresses me, I won’t deny that there’s something really fun about the manga that the anime doesn’t posses and for that I definitely recommend reading the manga! If I had to complain about something then I would say that I really miss the voices combined with the music and explosive destruction, especially during the scene that Mira’s father uses the double coil. In the manga everything happens in one page, which was disappointing. Of course, it’s impossible to transfer over the audio to the manga but I just wish there’d been a way to pass over that emotion. I mean, I got goosebumps in that scene even after re-watching it! Dimension W manga is licensed by Yen Press and written by Iwahara Yuji. Translation is by Amanda Haley. In Japan there are currently 9 volumes published and the series is still ongoing. I recently saw the first episode of this anime on Saturday and I enjoyed it. I find it strange that the manga and anime are somewhat different based on this post. I guess it’s one of those moments that the manga does better than the anime. I did enjoy it. I guess it kinda felt like Cowboy Bebop mixed in with some Science Fiction. I enjoyed this topic you made and I can’t wait to see more of Dimension W. It has a nice start. I got the manga last week, really liking the series. Right now I am trying to figure out where exactly they will end in the manga for the anime. The manga is monthly but with over 80 chapters. It is nice to see them follow it faithfully though. I just saw the first episode via Toonami as well so it’ll be interesting to see where it goes. I’ve heard that it supposedly starts to fall apart in a few episodes, but you seem to still be a big fan so I suppose that mileage will vary. I’ll definitely end up checking out the manga as well soon. The action scenes and the animation are great so far with my only issue being that the supporting characters don’t seem all that interesting yet. (The main lead is great though) It’s cool to see the comparisons. I definitely agree that you can definitely start to miss all of the sounds. I don’t mind connecting the dots and forming my own theories so that sounds like it could be fun. The only sad part is when I make my own super in depth theory and then the show decides to debunk it with a season 2 or some kind of late plot twist. Boooo, still I’m looking forward to seeing this through to the end. I typically prefer the anime myself, but there are cases where the manga wins for me like with Black Cat. The anime was fun, but it skipped a lot of the parts which made the manga so enjoyable. If the anime diverges, 9 times out of 10, I’m definitely going to be on the manga side! Noooooo! D: Well, I’ve definitely had quite a few series that I started and never finished like Tai Chi Chasers, but I highly recommend checking out the manga again someday. I consider it to be one of the best Shonen Jump titles out there! Train Heartnet in particular (Main character) is one of my favorite leads. Next OGZ Hiatus & Thank You!